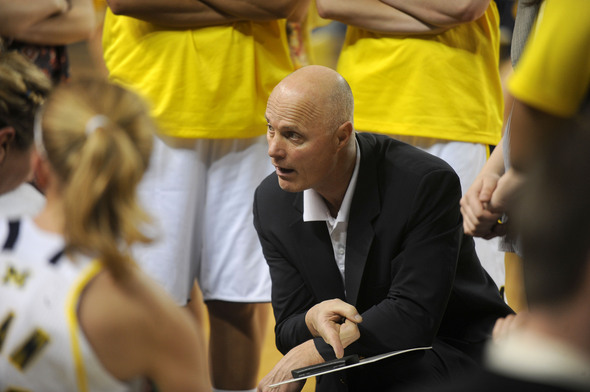 Posted on Tue, Apr 26, 2011 : 3:35 p.m.
Michigan women's basketball coach Kevin Borseth expects to see more aggressive play from the Wolverines in the 2011-12 season. For the second consecutive season, the Michigan women's basketball team sat on the cusp of the NCAA tournament but ended up playing in the WNIT. Graduating one player — senior guard Veronica Hicks — Michigan returns a core of a team that looked like it would make the 64-team NCAA field until struggling in the season's final weeks. A month removed from that, women's basketball coach Kevin Borseth sat down for a two-part interview. In Part I, Borseth breaks down the future of the program — both in personnel and how close he thinks the team is to making the NCAA tournament. Q: Where do you feel you guys are at, off-season-wise? Plus, you lose (Veronica Hicks). Kevin Borseth: We have a lot of kids coming back with a lot of experience, and we need to take it another step, be a little bit more serious in how we approach the game. We did a lot of strategic things last year to cover our bases for every imaginable place we could. We thought we had an answer for everything; if somebody presses us, they zone us. But as a result, we weren’t very aggressive. We have to get ourselves to an aggressive state, back to an aggressive mode because the only way you’re going to be good in this game is if you can make things happen on the defensive end of the court. This year, in my opinion, we didn’t make enough happen. So we need to really re-adjust what we do and really need to get our kids, our focus really has to be on aggressiveness and getting ourselves in shape. What we worked on in the short spring that we had, we worked on playing the game at an elevated pace, pushing each other in pickup games where before it was go with the flow and just play and go through the motions. That’s not going to get it done. Q: When you look at the season, how do you replace Roni? In reality, your team is going to take on a new face, whatever that face is, and you’ve got players that have to step up and play. One year makes a whole difference in the world to a player, providing they get themselves in position to do it. But our makeup will change, the things that we do, the people we look to in crunch time offensively, defensively. That goes with the territory. So I don’t know if you could ever replace a player that you lose, your team just takes on a new face. Same direction, but a different direction. Q: Who becomes that face next year? KB: I don’t know. I look out, and a kid like Kate Thompson came off the bench and did a good job last year. Is Kate going to be the kid for us? Is Carmen (Reynolds) going to have a breakout year? I think last year Carmen plateaued, and a lot of people knew that Carmen could shoot the 3-point shot but couldn’t really create enough off the dribble. That’s her big thing this summer, being able to shoot the ball off the dribble. She’s really good. Jenny Ryan: Will Jenny become a little bit more aggressive in her play? Sam Arnold, Rachel Sheffer. We’ve got kids who have played, have played significant roles and achieved success this year. But when the balls are rolled out next year, someone, if not everyone, has to step to the forefront and fill those holes. Q: Having more height change things because all those players, every one of them you named but one is over 6 feet? Q: Your incoming freshman class, do you see any of them making an immediate difference for you? KB: Our freshmen coming in have to make a contribution. Brenae Harris (a guard from Marion, Ohio) is a kid who has the ability to make a contribution. Aquashia (Anderson, a guard from Meridian, Miss.) blew her knee out at an all-star game in Mississippi so I don’t know what her status is going to be. She’s going to have surgery here in the next couple of weeks, and then it’s a six-month waiting period to see how it all pans out. But she’s a pretty good player, but how you do coming off a knee injury is too early to tell. Cyesha (Goree, a forward from Grand Rapids) has to be able to get herself in shape, great hands, good rebounder. But that time when you leap from high school to college is just different. All of a sudden you go from a practice where you practice an hour-and-a-half and you’re sharing the gym with someone else to all of a sudden you’re going to a commitment to basketball. All of a sudden it’s sink or swim. Your game has a great deal to elevate because there is a great deal of emphasis placed on it. Q: What are you going to do in the off-season? Any plans? KB: We’ve been in here every day trying to go over this recruiting and stay on top of it because it is our lifeblood at this point. Try to get outside, get some exercise as best we can. That’s allowed us to keep us fresh. You’re sitting here and after a while you’re staring at these walls, you know what I mean, stare at this computer, you can only stare at it so long until it drives you batty because you sometimes outthink yourself. But recruitment is extremely important, working hard to do that. We’ve got basketball camps we’re going to deal with, recruiting in July. Somewhere in between there we have to make time for family and exercise and fun. Q: So any trips planned? KB: My parents are up north so we’ll go up there, two or three times I’ll travel up there, spend some time on the lake, get up there and swim and do all the things that you do along the water. Fish, try to do some of that. Q: Looking at basketball again, you guys have been pretty close the last two years to the tournament. Do you feel like this is a make-or-break type of year? KB: It’s not make-or-break. I’ll tell you what. When it turns, it turns. We’ve probably, we wanted to get into that tournament the past couple years, and we were in the postseason. We’re slowly making the turn. I tell some people we’re like the stock market, we’re slowly making a climb, but every now and then there’s one of these days where, ‘Boom, you hit rock bottom.’ But the next day, ‘Boom, you bounce back up again.’ Our program is at that stage. I don’t know if we’re looking for quick fixes. We’re looking to build a good, solid foundation of kids that we have. Make sure that we’re rock solid on the bottom and work our way up. In my opinion, it’s not make-or-break. We’re not putting ourselves mentally in a make-or-break capacity, the program’s future. But we want to get better. We need to continue an upward climb and that’s important. Q: You’ve been successful everywhere you’ve been. Do you feel you guys are close? Or is it still a bit more away than it looks? KB: We’re moving in the right direction, the culture. Everything is moving in the right direction, and that’s what we want it to do, move in the right direction. If we have a breakout year, when it changes, it changes and it changes forever. You become a major player in your conference and in the country and all of a sudden when it changes, it changes and it doesn’t go back. From there, it just takes right off. Probably taking longer than I anticipated it was going to take, but right now we’re taking baby steps and doing it the right way. Wed, Apr 27, 2011 : 9:29 p.m. I'm not at all sure why my comment on the McPherson thread was removed. Why is a direct shot at Borseth from the McPhersons allowed to go unchallenged? Thu, Apr 28, 2011 : 1:31 a.m.
Maybe you pointed out how ... out-of-shape ... Kalyn appeared to be in a less than kind manner? Wed, Apr 27, 2011 : 7:08 p.m. I'm somewhat disappointed with the results of these few past seasons. but i am a u of m fan, and believe KB is a good coach. msu is beating up on michigan in recruiting, but we won't know how true that is until next season!! none of suzy recruits have impacted msu's runs the last 3 seasons!! those girls weren't suzy's recruits! now we will see, msu has the best girls in michigan over the last couple years, depending on who you are? some feel michigans best players are leaving the state, or not attending either school? suzy has the clear advantage sticking with the michigan girls, while borseth likes 6ft + perimeter players who aren't strong in the post or at defending the post. which is beautiful..in the horizon league, not the BIG 10(+2)!! U OF M has beat up on some very good teams out of the conference, but in conference they're so inconsistant , and haven't sniiffed BIG 10 contention!! give KB at least 2 more years, as he is grooming his assistant head coach for the job!! she's been very sucessful in women's basketball IN the state of MICHIGAN!!! she's paid her dues(as suzy did) and is more than deserving of the job should KB moves on!! Fri, Apr 29, 2011 : 2:09 a.m.
Why tolarate 2 more years of this staff? We are trailing badly in the big ten and not going to the NCAA and recruiting poorly. What exactly are we waiting for? Wed, Apr 27, 2011 : 1:27 p.m. When I read comments like these, it makes me realize how little people pay attention to Michigan women's basketball. All they know is that it is UNACCEPTABLE to not be winning every game. The terrible Cheryl Burnett years -- I won't even go into those in detail so early in the morning, but if you can't see how things are improving, it's because you have no clue. Either that, or you're Michigan State fans looking to sow discord, because we gotta keep the comments exciting! Tue, Apr 26, 2011 : 11:56 p.m.
Borseth's tenure has been an abject failure. No NCAA appearances. No Big Ten titles. And, quite frankly, no prospects to be truly competitive in the near future (sorry ladies). In-state recruiting is a significant issue, as Borseth is being completely overmatched by MSU and Suzy Merchant. His unbridled intensity and comportment issues are no doubt a significant turn-off for recruits and parents alike. Frankly, I would not want my daughter to play for him. The clipboard snapping, press conference meltdowns, and sideline behavior are embarrassing and beneath acceptable coaching standards of this university. It is time for the powers that be to admit that Borseth is not a good fit for this program. His coaching performance does not warrant it, nor does his representation of the university. Let's get someone who can build a winner. Someone that brings respect to the program and someone for whom in-state recruits want to play. The young student athletes deserve better. Tue, May 3, 2011 : 2:12 p.m. I think you mean MSU and Joanne P. McCaully as she is the only reason MSU is in the position they are. Michigan women's basketball has never really been a respected WBB program because it never existed before Borseth got here. He is rebuilding the program from the ground up and finishing 3rd in the B10 is pretty damn good from where they started a few years back. His representation of the University? What has he done that warrants you even saying this? Wed, Apr 27, 2011 : 1:58 a.m.
Oh, please. Borseth took over a program that won 5 Big Ten games in three years and this year we were 3rd seed in the Big Ten tournament. Suzy Merchant took over a program that made it to the NCAA final game two years before she came. So far she's depended almost entirely on recruits from McCallie. Keane, Johnson, and Thomas, the go-to players on this year's team, were all signed by McCallie although they never played for her. Over program is now substantially better than it's been in many many years. Tue, Apr 26, 2011 : 10:15 p.m. The problem is recruiting for sure. Suzy Merchant got to State after Kevin but is already out recruiting him. Of this years top 5 Michigan Miss BB finalists 2 or 3 are going to state and none to Michigan. Are you serious? It is time for a change. Why Bill Martin did not hire Suzy I will never know but it is easy to see she will extract revenge on us for years to come. Boreseth has had several years now and no NCAA. Not good and missing on the top recruits in his home state. Not a recipe for success. This staff has been a big disappointment. Tue, May 3, 2011 : 2:07 p.m.
First, Jenny Ryan won Ms. Basketball in '09 so he obviously has the capabilities to get the top players in the State, but it all depends on what the team needs depth wise. If the top 5 players in the state are all forwards (hypothetical situation) thats awesome, but since Michigan is set right now at the forward position there is no need to recruit them. Recruiting is a lot more than just looking at the &quot;rankings&quot; of high school athletes. The most important thing is that they will fit in well with the program and the school both athletically AND academically. Wed, Apr 27, 2011 : 2:56 a.m.